Harness the power of the sun to make art! This unique leaf print needs a little bit of advance planning—and some patience—but from there, it’s pretty simple. Kids will enjoy exploring the visual effects of strong sunlight. And of course, the question to ask all budding scientists is: What do you think will happen? One week ahead: Dry the leaves by placing them between two paper towels and putting the paper towels between the pages of a heavy book. 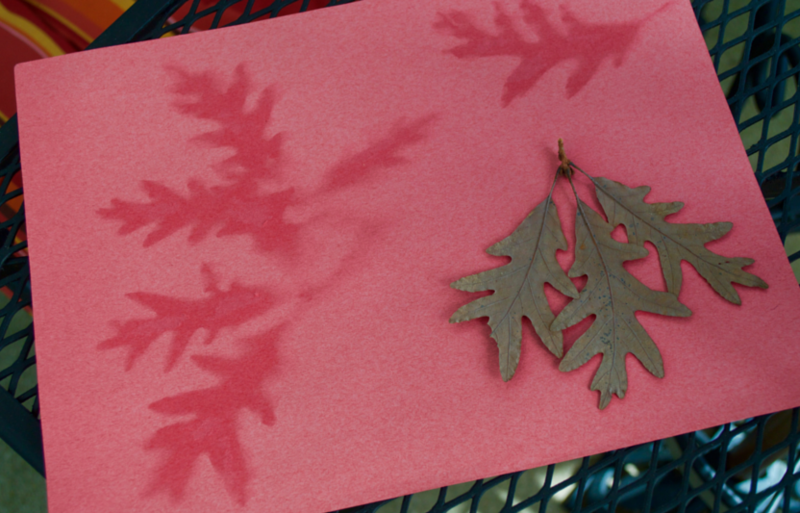 Place the leaves on dark construction paper in a sunny place that doesn’t get a breeze. Leave the paper for two days. Younger children: Encourage your child to turn the print into a card or piece of wall art. To make wall art: Help your child mount the print on a heavy piece of paper. Make sure the gift recipient hangs it in a spot that doesn’t get much sunlight. To make a greeting card: Fold a piece of heavy paper in half, and glue the leaf print to the front. Older children: Help your child expand the print. Tape together several pieces of dark construction paper (all the same color or a variety of colors). Then dry out lots of leaves and lay them across the extended paper.